Like many other famous composers, Felix Mendelssohn began his musical life as a child prodigy. He and his siblings learned many languages and artistics pursuits from their mother. Felix Mendelssohn, born in Hamburg, performed at the piano and composed music from a very early age. His elder sister Fanny was also a child prodigy and was to become a notable composer in her own right. The social life of their parents brought them widespread recognition, and provided much experience. Their grandfather was a Jewish philosopher, but their father (a banker) left the Jewish faith for Christianity and adopted the family name of Bartholdy which is why Felix's surname is sometimes quoted as Mendelssohn-Bartholdy. Fanny was to become Fanny Hensel upon her marriage. As a young boy, Felix met and befriended the elder Goethe who was to prove an enduring influence on the musician. Felix Mendelssohn toured Europe visiting a number of countries where he sketched musical fragments later to be turned into concert works, which is why a number of his works bear titles suggesting these countries. He visited Scotland, writing the seeds for his Scottish Symphony and the Fingal's Cave overture (following a trip to visit the Isle of Staffa, near Mull) and meeting Sir Walter Scott. He sketched his Italian Symphony while visiting Rome and Naples, and note that three of his "Songs Without Words" are Venetian Boat Songs. He was famous particularly in his native Germany and in England, a country he visited several times becoming a favourite of Queen Victoria. He first performed his oratorio Elijah in 1846 at the Birmingham Festival. In his mature years he was to hold a number of posts in Dusseldorf, Berlin and Leipzig where he worked closely with Robert Schumann. His health declined rapidly after hearing of the death of his sister Fanny, he himself dying a few month later. Clearly Mendelssohn lived during the early Romantic period in the wake of the great Classical composers like Haydn, Mozart and Beethoven whose music he studied and knew well. A particular influence was Bach. At the age of 20, Mendelssohn conducted Bach's St. Matthew Passion. This was the first performance of this work since the composer's death and was instrumental in leading a revival of interest in the Baroque composer among the concert-going public which has lasted to this day. Mendelssohn himself wrote some fugues and, like Mozart and Beethoven, was to incorporate fugal material into other works. In addition to Bach, Mendelssohn also championed the music of Schubert and conducted the premiere of Schubert's Great C major Symphony 11 years after the composer's death. Mendelssohn's music is firmly classical in form and romantic in nature. Like his contemporary Schumann, his music is largely pleasant and evocative, without the strong passions, opinions or inner turmoil of other composers. Although some of his works were clearly inspired by external events and bear highly descriptive titles, he shied away from any programmatic interpretations voicing the opinion that music was to be interpreted by the listener. Among the many works in traditional classical forms are symphonies, concertos, string quartets, etc. and he was also quite fond of the stand-alone concert overture which under other composers in later decades was to evolve into the tone poem. 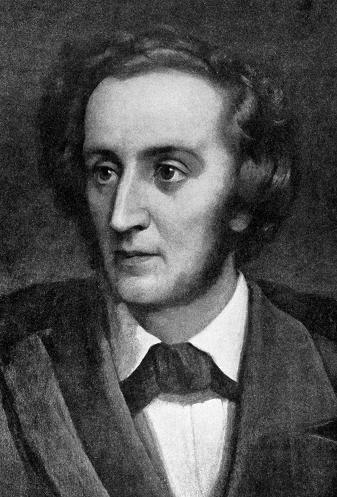 Mendelssohn's Songs Without Words for piano were also a novel form and underlined his belief that music need not be programmatic, though publishers were to add suggestive titles to these works. Also on mfiles, here is Jeffrey Dane's article about Mendelssohn called Facility and Mastery. and "On Wings of Song"
Overtures: Calm Sea and Prosperous Voyage (after 2 poems by Goethe), Athalia (the incidental music for this includes the well-known "War March of the Priests"), Son and Stranger, Ruy Blas, Fingal's Cave or Hebrides overture, A Midsummer Night's Dream (This was composed in his teans, and then augmented in later years with full incidental music for Shakespeare's play, including the famous Wedding March). Oratorio: Elijah, including the song "Oh for the Wings of a Dove" later remixed by Madness! A Total of 5 mature Symphonies (3rd The Scottish, 4th The Italian, and 5th The Reformation) and a number of String Symphonies composed in his youth.